In our last blog post, we touched on two of the pests that your pets are likely to bring home. One of the pests that we’re accustomed to worrying about when it comes to our pets are fleas. They’re a pest that is well known for finding domesticated animal hosts and for being easy to pass from one pet to another. Though fleas have been something that we’ve always been told to keep an eye out for, would you be able to recognize fleas if the were on your cat or dog? Many people think they would be able to but, more often than not, we are blind to the signs and symptoms that our pets are showing us. In today’s blog post we are going to touch on a few of the symptoms that are associated with fleas so that you can recognize them if your pet starts to show signs. Let’s get started. One of the most obvious signs that your pets might have fleas is that they are scratching more than usual. Fleas are a pest that feed off of our pet’s blood as their food source. Once the fleas have jumped onto their new host, the first thing that they’re going to do is bite into the top layer of skin and work their way to your pet’s bloodstream. Usually, fleas will try to make their way to parts of your pet’s body that are unusual and can be difficult for them to reach. Some of the most common places that fleas are found are the neck, tail, underarms, groin, and head. 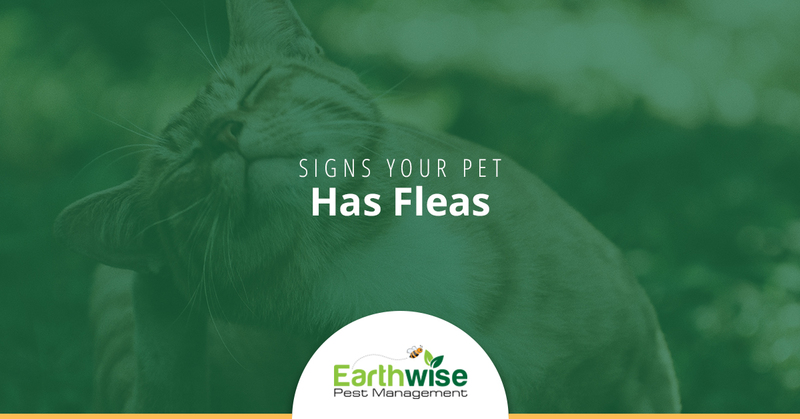 Since they are difficult to reach, your pet is going to continue to try and itch the spaces where the fleas have created their habitat and are biting into their skin. Given that this is incredibly irritating for them, it should be clear to understand why they are scratching, biting and itching endlessly. Now, licking and scratching is something that immediately draws us to think that they have fleas, but it’s not a dead giveaway. There are, however, lots of reasons that your pet could be doing this, so you shouldn’t stop the inspection for fleas here. Keep reading, we’re going to touch on a few of the different symptoms that you should look out for. While the biting and feeding are incredibly irritable, it’s not the only part of fleas that could be bothering your pet. For some pets, the flea saliva can be allergenic and create additional irritation for your pet. If this is the case for your pet, you might see red patches of skin where the flea has irritated the skin. It can be in areas where the fleas have made their habitat, or it could show up in the form of a rash across your pet’s skin. After so much itching, you can anticipate a little bit of hair loss. More often than not, the hair loss occurs because of the scratching and licking that your pet is doing. While it is partially due to their reaction to the bites, it could also be associated with their reaction to the flea bites and their allergic reaction. In some cases, pets could develop alopecia which causes them to lose patches of hair all over their body. If you note that your pet starts to lose chunks of hair, you should get a diagnosis for the alopecia and its severity to ensure proper treatment. The last point that we’re going to cover is fleas themselves. While they are incredibly small pests, they can be seen by the human eye. If you start to become suspicious that your pet may have fleas, you should inspect their coat to see if there are any visible fleas that can turn it into a certainty. Aside from fleas, you should keep an eye out for flea “dirt.” This isn’t true dirt, but feces. As gross as it may sound, flea dirt is the composed feces of fleas after they’ve digested your pet’s blood. It can be challenging to determine what is real dirt and what is flea dirt. What we suggest doing is taking any black specks off of your pet’s hair and putting them onto a piece of white paper. Sprinkle water over them, and if they turn a shade of red, then you can be certain that they are flea dirt. If you notice fleas or flea dirt in your pet’s coat, make sure to have them treated as soon as possible. While our team won’t be able to help much in regards to treating your pet, we can help with the pests that you’re struggling with. Fleas are one of the most common pests that we have to deal with in the homes where pets are present. In the case that you do find one of your pets has been infected by fleas, you want to make sure that any infestation is taken care of as soon as possible. A visit to the vet is something that needs to happen, but you also want to ensure that there aren’t any lingering fleas in your home. Our team can ensure that’s the case! Earthwise Pest Management has been serving the Sacramento area with high-quality pest control services for years. From bed bugs and fleas to rodents and snakes, we have the knowledge and resources necessary to provide you with the long-term solutions you’re looking for. Contact our team with any questions or inquiries, and we’d be happy to assist you with any questions or inquiries.